"The eruption of the smallpox is preceded by a continued fever, pain in the back, itching in the nose and terrors in the sleep. These are the more peculiar symptoms of its approach, especially a pain in the back with fever; then also a pricking which the patient feels all over his body; a fullness of the face, which at times comes and goes; an inflamed color, and vehement redness in both cheeks; a redness of both the eyes, heaviness of the whole body; great uneasiness, the symptoms of which are stretching and yawning; a pain in the throat and chest, with slight difficulty in breathing and cough; a dryness of the breath, thick spittle and hoarseness of the voice; pain and heaviness of the head; inquietude, nausea and anxiety; (with this difference that the inquietude, nausea and anxiety are more frequent in the measles than in the smallpox; while on the other hand, the pain in the back is more peculiar to the smallpox than to the measles) heat of the whole body; an inflamed colon, and shining redness, especially an intense redness of the gums." 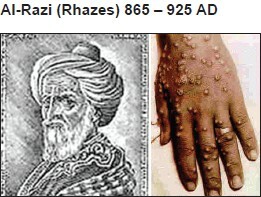 The above account was written by Rhazes in the 9 th century and is the earliest known description of smallpox. It is considered a "masterpiece in clinical medicine" and according to some writers "describes the clinical difference between the two diseases so vividly that nothing has been added." "When, therefore, you see these symptoms, or some of the worst of them (such as pain of the back, and the terrors of sleep, with the continued fever) then you may be assured that the eruption of one or the other of these diseases in the patient is nigh at hand; except that there is not in the measles so much pain of the back as in smallpox; nor in the smallpox so much anxiety and nausea as in measles, unless the smallpox be of a bad sort; and this shows that the measles came from a very bilious blood." The original manuscript is reportedly kept in the Leiden University Library in the Netherlands. The book was translated several times into Latin and other European languages such as French, English, and German. It was published several times in Europe from the 15 th to the 19 th centuries. Rhazes was born in the city of Rayy, Iran in 865 AD, worked as a physician in Baghdad, and died in Rayy in 925 AD. He published over 1000 books, several of which were translated into Latin, French, Italian, Hebrew, and Greek. One of his main books, known as Liber Al-Mansoris, a short general textbook on medicine in ten chapters included all aspects of health and disease and became one of the most widely read medieval medical manuals in Europe. The ninth chapter, on therapeutics, was frequently circulated by itself under the title Liber ad Almansorem. During the Renaissance, many editions of it were printed with commentaries by the prominent physicians of the day such as Andreas Vesalius. The most sought after of all his books was The Comprehensive Book on Medicine (Kitab al-Hawi fi al-tibb) [Figure 1], which consisted of 22 volumes. It was a large private notebook or commonplace book where he recorded clinical cases from his practice and extracts from earlier authors regarding diseases and therapy. The clinical cases he compiled are the most numerous and varied in Islamic medical literature. The book is simply known as al-Hawi in modern terminology but it was the encyclopedia of medicine for that time. It was one of the main textbooks in the medical school in Paris, especially its 9 th volume on pharmacology. Because al-Razi was meticulous in crediting his sources, the Hawi became an extremely important source of Greek knowledge that was lost when Europe was plunged into the so-called Dark Ages. Translated excerpts from his books demonstrate that Al-Razi was a superb clinician - observing, gathering clues, comparing his experience with that of colleagues and the medical literature of his time, namely the writings of Hippocrates, Aristotle, and Galen, and making his own conclusions about a variety of conditions in medicine. Al-Razi stated that fever is a symptom and not a disease. He is credited with making sutures from animal guts. He also recommended recruiting physicians who worked in large cities and capitals rather than those practicing in rural areas, with preference given to those with experience in research. Lacking the sophisticated diagnostic tests that are readily available to modern physicians, he devised clever and ingenious ways of diagnosis. For example, he diagnosed diabetes by asking the suspected patient to urinate on the sand, leave it, and if ants collected on the spot after a period, then the patient was diabetic. Al-Razi had an intuitive sense of hygienic principles far ahead of medieval standards. He was once asked to choose the site for a new hospital in Baghdad. He suspended pieces of meat at various points around the city, and at the location where the meat putrefied most slowly, he recommended building the hospital. Al-Razi used the term, "sudden death" in Arabic 1000 years ago, when he drew attention to the fact that the heart was responsible for syncope and sudden death: "Sudden death takes place when the heart contracts but does not relax. "He also stated: "In the heart, there are eight types of bad tempers, blockage in its arteries, blockage in its opening and swelling followed by irregular pulses, fast and then syncope. Sirabon: "If palpitation occurs with hot swelling in the pericardium, it will lead to a quick death. The sign for that is, loss of consciousness with irregular pulse and unbearable sensation of heat in the chest. Bolis: "if hot swelling happens in the heart with ill feeling it leads to quick death. When associated with fainting, loss of power, weakness of breathing, smallness of the pulse, coldness of the extremities, sweating in some part of the body and the loss of consciousness is complete... no treatment for him. Al-Razi wrote on a variety of medical topics. He wrote a book on the value of food, Man-fia'- Al-aghzia [Figure 3]. He described the good and the bad effect of each food item. For example, about coffee, he said: "It is a drink that is good for those with hot nature, but it decrease the libido ". This is interesting because coffee was discovered in 850 AD, about ten years before his birth and it certainly was not known in Europe before the 17 th century. Coffee was used as medicine in the time of Al-Razi. Al-Razi was a superb teacher. He said to his students: "Collect medical books, as many as you can. Make one of your own from your daily observations and record in each case: Definitions, causes, signs, treatments, and ominous signs... this will be your personal treasure. On research, he recommended using control for clinical research. He said: "If you want to study the effect of bloodletting on a condition, divide the patients into two groups, perform bloodletting only on one group, watch both, and compare the results." Like the Islamic philosophers, physicians, and scientists of his time, much of his learning came from Greek thinkers. Historians who have analyzed his works say that passages from his books like the Hawi demonstrate his originality and independent spirit. He rejected the mind-body dichotomy of the Greek school. He pioneered the concept of mental health and self-esteem as essential to a patient's welfare. With this in mind, he encouraged his patients to follow his advice coupled with advice on the power of positive thinking. This theory, "sound mind, healthy body", was a concept that was way ahead of his time. In his writings, although acknowledging and expressing his admiration of Galen's contributions, Al-Razi criticized and refuted the great man's revered theories, most notably, the Theory of Humors. Many accused al-Razi of ignorance, since he heavily criticized Galen's work. However, Al-Razi repeatedly expressed praises and gratitude to Galen for his commendable contributions and labors, saying: "I prayed to God to direct and lead me to the truth in writing this book. It grieves me to oppose and criticize the man Galen from whose sea of knowledge I have drawn much. Indeed, he is the master and I am the servant (disciple). But all this reverence and appreciation will and should not prevent me from doubting, as I did, what is erroneous among his theories. I imagine and feel deep in my heart that Galen has chosen me to undertake this task, and if he was alive, he would have congratulated me on what I am doing. I say this because Galen's aim was to seek and find the truth and to bring light out of darkness. Indeed, I wish he was alive to read what I have published. Because of enticements to follow one's own fancy or impetuosity in imagining that what he does or says is right. Al-Razi believed that contemporary scientists and scholars, because of accumulated knowledge at their disposal are better equipped, more knowledgeable, and competent than the ancients. Because of the continuous discoveries of new data and new truths, there is crystallization of ancient knowledge in view of the dynamic nature of science so that present day knowledge must of necessity surpass that of previous generations. Indeed, what Al-Razi did in attempting to overthrow blind reverence and the unchallenged authority of ancient sages encouraged and stimulated research and advances in the arts, technology, and the sciences. It set the human spirit and intellect free for greater achievements. The eminent British historian, Edward Granville Browne (1862-1926), said that Al-Razi was "probably the greatest and most original of all the physicians and one of the most prolific as an author".